Not only are whales spyhopping more than usual off the SoCal coast this year, they’re putting on shows rarely seen in this part of the Pacific. An amorous pair of gray whales was spotted rolling in the surf about 2 miles off the Dana Point coast Sunday — a ritual suggestive of courtship and possibly mating, and usually seen farther out in the ocean. “It’s not often that we catch this behavior on film,” said Alisa Schulman-Janiger, director and coordinator for ACS/LA Gray Whale Census and Behavior Project. Schulman-Janiger was hesitant to describe the behavior as mating since it wasn’t clear exactly what was happening underwater, but she said the whales rolling, breaching and touching certainly looks like courtship. A camera on board Captain Dave’s Dolphin & Whale Watching Safari captured the moment, embedded below. Among the voyeurs witnessing the couple were a pod of curious bottlenose dolphins, kayakers and a stand-up paddle boarder. “Apparently everyone was curious, especially the dolphin. We often see pacific white-sided dolphin interacting with these whales but to have bottlenose dolphin was extraordinary,” Captain Dave Anderson said. Every year, gray whales migrate some 12,000 miles from their feeding grounds near Alaska and British Columbia to the warm, protected lagoons of Baja California — hundreds of miles south of Dana Point — to give birth and nurse their calves. “We don’t know why these two whales chose to make a stop along the way,” Anderson said. It’s also a mystery why this season has been particularly plentiful for whale watchers off the Southern California coast. Schulman-Janiger said gray whale sightings are the second-highest they’ve been in 31 years, and several factors could be contributing to the trend. California’s extremely dry winter has made visibility along the coast consistently better, so watchers may be seeing more whales simply because conditions are clearer, Schulman-Janiger said. “If you can see them, you can count them,” she said. Another possibility lies in the whales’ arctic feeding grounds, which froze earlier than usual this year, forcing them to head south sooner than expected. But that still doesn’t explain why so many whales are appearing to hug the shore, a route typically taken by young whales who aren’t in such a rush to get to the Baja lagoons and mate. Schulman-Janiger said scientists will need to see the whole picture of this year’s season before a conclusion can be reached. So far, Captain Dave’s safaris have had 168 gray whale encounters this season, which runs from January to May. By comparison, the safaris recorded 78 sightings of gray whales last year, the group said. About 50 miles north along the Palos Verdes Peninsula, where Schulman-Janiger’s whale census project is stationed, there have been about 738 gray whale sightings since Dec. 1, 2013. That’s up about 200 since last year and more than twice the average, according to data from the ACS/LA Gray Whale Census and Behavior Project, pictured above. For those hoping to spot whales, the creatures will continue migrating south until about mid-February. At the end of April and beginning of May, mothers and their calves will start moving northward again. To protect the still-vulnerable juveniles, these pairs tend to hug the shore so there’s a better chance of spotting them on their way back to arctic feeding grounds, Schulman-Janiger said. The cause is thought to be cetacean morbillivirus, which has been confirmed or is suspected in 32 of 33 dolphins tested, she said. Marine officials are looking at the possibility of other factors, including high levels of polychlorinated biphenyls and other chemicals in the water, but have not linked the die-off to anything else. From 2007 to 2012, the average number of yearly strandings — when dead or dying dolphins wash ashore — in the same states was 36, Rowles said. The virus poses no threat to people, although it is related to the virus that causes measles in humans and distemper in canines. So far, there is no evidence of the virus jumping to other species, but other animals that have washed ashore are being tested, the scientists said in a telephone news conference Tuesday afternoon. Secondary infections could be dangerous. Authorities urged people to stay away from stranded dolphins. “For people not trained in working with these animals and who don’t understand the risk, it’s much better . . . to stay away from them, particularly if you have open wounds,” Rowles said. It is not clear what started the most recent problem, but Jerry Saliki, a virologist at the University of Georgia, said enough time had probably passed since the last mass die-off that herds of dolphins now lack natural immunity to morbillivirus. The virus is spread by direct contact between the animals or inhalation of droplets exhaled by infected dolphins above the water’s surface. “When the collective immunity drops below a certain, critical point, which we don’t really know for marine mammals, then the whole population becomes susceptible,” Saliki said. Generally, the virus causes death by suppressing the immune system, leaving the dolphin vulnerable to pneumonia and other lethal infections. The large number of deaths in Virginia “is really not surprising if you understand how the population of dolphins works,” said W. Mark Swingle, director of research and conservation for the Virginia Aquarium and Marine Science Center, which is part of a network of agencies that responds to marine animal strandings along the East Coast. China’s unique white dolphins — famous for the actual pink hue of their skin — face going from endangered to extinct — with conservationists doubtful they can be saved. “We’ve seen alarming decline in the last decade — 158 dolphins in 2003, just 61 dolphins in 2012,” says Samuel Hung, Chairman of the Hong Kong Dolphin Conservation Society. Land reclamation for massive engineering projects, resulting water pollution and boat strikes have exacted a heavy toll on the white dolphin population, which is mainly found in the waters of Hong Kong’s Pearl River Delta in southern China. By 2023, Hong Kong aims to complete a third runway for Chep Lap Kok international airport, already one of the world’s busiest. In the absence of soil on which to build, 650 hectares of land — an area more than 5,000 Olympic-sized swimming pools — will be reclaimed from the sea. The area is also prime habitat for the Chinese white dolphin. The Hong Kong government has also proposed four additional land reclamation projects in dolphin-populated areas that aim to increase the amount of land on which to build in order to bring down the high cost of housing, adds Hung. Yet, despite Hong Kong’s plans for numerous engineering projects that will impact the white dolphins’ habitats, the founder of the 10-year old Hong Kong Dolphin Conservation Society says he “actually applauds” the government’s conservation efforts. “I don’t doubt their desire to conserve,” explains Hung, who adds that the Hong Kong government has provided more than $1 million Hong Kong dollars (US$125,000) each year for environmental research funds, set up a marine protection park for the white dolphins and helped monitor dolphin population numbers. “But it’s the other bureaus who want to push economic projects” including Hong Kong’s Airport Authority and the Civil Engineering and Development Department, says Hung. 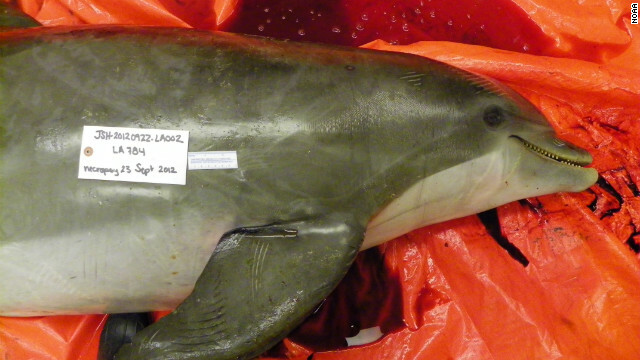 A group of sperm whales appear to have taken in a deformed bottlenose dolphin, marine researchers have discovered. Behavioral ecologists Alexander Wilson and Jens Krause of Berlin’s Leibniz-Institute of Freshwater Ecology and Inland Fisheries came across the heartwarming scene some 15 to 20 kilometers off the Azores in the North Atlantic, as they observed the dolphin six times while it nuzzled and rubbed members of the group, reports the journal Science. “It really looked like they had accepted the dolphin for whatever reason. They were being very sociable,” Wilson told the journal. The dolphin’s unfortunate deformity — a spinal disfigurement, likely a birth defect, which gives its back half an “S” shape — could help explain how it’s come to be taken in by the sperm whale group, explains Science. “Sometimes some individuals can be picked on. It might be that this individual didn’t fit in, so to speak, with its original group,” Wilson says, speculating that the deformity could have put the animal at a disadvantage among its own kind — perhaps it had a low social status, or just couldn’t keep up with the other dolphins. Sperm whales swim more slowly than dolphins, notes the journal, and the pod designates one member to “babysit” the calves near the surface while the other adults dive deep. But what was in it for the sperm whales? There’s no obvious advantage, Wilson tells Science. Conservation experts and federal agents say they’re looking into the violent deaths of several bottlenose dolphins along the northern Gulf Coast this year, including one that was shot and another that was stabbed with a screwdriver. “I can’t explain why anyone would shoot a dolphin,” Jeff Radonski, a Florida-based special agent for the National Oceanic and Atmospheric Administration, told CNN. Radonski said NOAA is investigating four of the six deaths reported since June. Samia Ahmad, a spokeswoman for the Institute for Marine Mammal Studies in Gulfport, Mississippi, said at least six dolphins had died as a result of foul play since January. In one case, a dolphin had its jaw cut off, she said. In September, a dolphin that washed up on Elmer’s Island, Louisiana, had been shot. The bullet that killed it was found in its lung, NOAA reported. In June, a bottlenose was found in Perdido Bay, on the Florida-Alabama state line, with a screwdriver stuck in its head, the agency said. Dolphins are covered by the Marine Mammal Protection Act, a 1972 law that makes killing them punishable by fines of up to $20,000 and a year in prison. In at least two previous cases, fishing charter captains have been found guilty of shooting at dolphins that approached their boats or the fish their passengers had hooked, NOAA says. NOAA spokeswoman Allison Garrett told CNN that the most recent prosecution involved a Panama City, Florida, man who was convicted of throwing pipe bombs at dolphins. He was sentenced to two years in prison in 2009 for violating the federal conservation law and for possessing an explosive device as a convicted felon.